"Satan's School of Warfare" is a medium sized level for good old Doom. However, this one falls into the category of levels I think of as "Made for Boom, even though they were written years ahead of it". 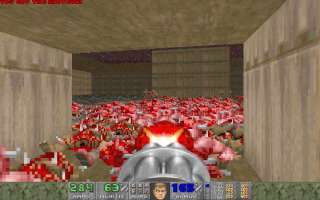 The level is literally packed with monsters; when I first played this level it was with the old doom.exe, which was completely overtaxed by this level. At least the text file mentions the massive slowdown, savegame crashes, and disappearing things that you're bound to get using old Doom. Fortunately this time I was armed with a Boom based port, so I could actually have a chance at doing this level. Even so, the vast blocks of monsters caused some slowdown. Early on the fights are tedious but tricky, as you open up a sucession of "classrooms" and blast away with the shotgun or chaingun as they try to get out the door. There are a couple of slightly better fights at least. You then head to the "final exam area", which means a large room where hundreds of monsters are released all at once to get you. I held down fire with the rocket launcher until i ran out of ammo, then actually had to do some dodging to clean up with the chaingun. BTW, no rockets were wasted, as you can tell from the screenshot. Finally there are a cluster of barons to shotgun in the massive space provided. The architecture is pretty basic in the areas I went through, though at least a style was kept to. However most rooms were pretty featureless, single texture jobs :-/. The outdoor part was the best looking part, but still very basic. If you haven't got the idea by now, this level is completely over the top with monsters, but that doesn't give good gameplay. And the architecture isn't much either. This level is a great test that a port can handle thing overload, but I can't recommend it for actual play. 1fifwar3.zip, size 66kb, date 1997/12/2. FILE_ID.DIZ, size 1kb, date 1994/9/23. !!READ! !.TXT, size 13kb, date 1994/9/23. WAR4.WAD, size 281kb, date 1994/9/21.